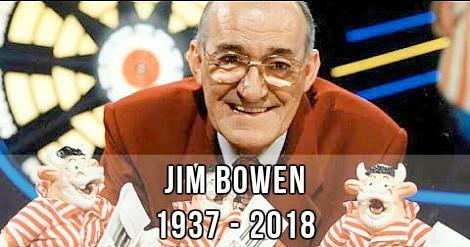 I was very saddened to hear about the death of yet another 80s legend today (14th March 2018), the host of Bullseye, Jim Bowen - what a super, smashing, great host he really was! The news came just a couple of days after the death of comedy legend Ken Dodd, who had actually inspired Bowen to become a comedian. Bowen's down-to-earth, warm and witty presenting style ensured that millions of us tuned in to watch the show every Sunday teatime on ITV during during the 1980s and first half of the 90s. At its peak, the programme was watched by around 17.5 million viewers - not bad for a show based around darts! I certainly remember sitting and watching the show every week without fail with my family. By the way, the first video clip (above) features the opening titles and theme music from the show. I also remember that professional darts was very popular with TV audiences back then, and darts players such as Eric Bristow, Bobby George, John Lowe and Jocky Wilson became major celebrities. To cash in on this popularity, ITV decided to create a darts-based game which allowed the general public to compete for prizes. The first series of Bullseye in 1981 was shown on Monday Nights, before moving to a more cosy Sunday afternoon slot in 1982. Tony Green also joined the show as a scorekeeper in the same year, and his role grew as the series progressed through the years. In 1994 and '95, the series was moved to a Saturday afternoon before it's final airing with Jim Bowen on 8th July 1995. The presenter of the revived series for Challenge, Dave Spikey, once appeared as a contestant in the original 1980s series. He also hosted the gameshow Chain Letters in 1997. Some of the prizes in the original series were surprisingly extravagant, especially compared to BBC game shows such as Blankety Blank, for instance. The star prize was often a speedboat (very handy if you lived in the midlands!) or a caravan, although occasionally there would be family car on offer such as a Talbot Samba or an Austin Metro. 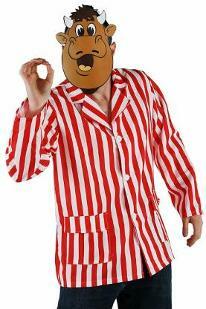 The legendary host, of course, became famous for his catchphrases such as "You can't beat a bit of bully!". Impressionists of the day would often exaggerate his catchphrases and "Super, Smashing, Great!" was one such example. In the game, three couples would compete, with a "thrower" and a "knower" in each pair - one would throw the darts and the other would answer the questions. In the penultimate game, the pair with the most points could throw darts for prizes. At this point, Jim Bowen would dig out his catchphrase "Keep out of the black and in the red, there's nothing in this game for two in a bed". The announcer, Tony Green (himself a former darts player), also had his own catchphrases including "Take it nice and slowly, there's no rush", or something along those lines. He would also announce the eight numbered prizes on the prize board starting with number one, screeching out "Iiiiiiiin one...", "Iiiiiiiin two..." etc, before announcing "and Bully's special prize..."
After finishing the prize board game, the two players would then choose whether to gamble the prizes they had just won to try and win the show's main prize. If they chose not to gamble, then the next pair would be called back in and asked if they would like to play, and if they turned down the offer then the final pair would play the final game. To win, the players would need ro score 101 or more with six darts - three darts each. To rub salt into the wounds, if the pair playing for the star prize lost, then Jim would dig out another one of his catchphrases "Let's have a look at what you could of won" before leading them over to the star prize - very cruel! However, there were consolation prizes, at least, including two bendy bullys, two sets of darts and a tankard. Beer-bellied darts players such as the aforementioned Eric Bristow and Jocky Wilson made regular appearances on the show to throw for a charity of their choice. Indeed, they became so well known that they even had computer games named after them. You may remember playing "Jocky Wilson's Darts Challenge" on your Commodore 64 or ZX Spectrum. Bullseye was first aired on ITV by the ATV network in 1981 and then by ATV's replacement network, Central, from 1982 until 1995. Re-runs of Bullseye (both the original and newer TV series) are regularly shown on the Freeview TV Channel Challenge. 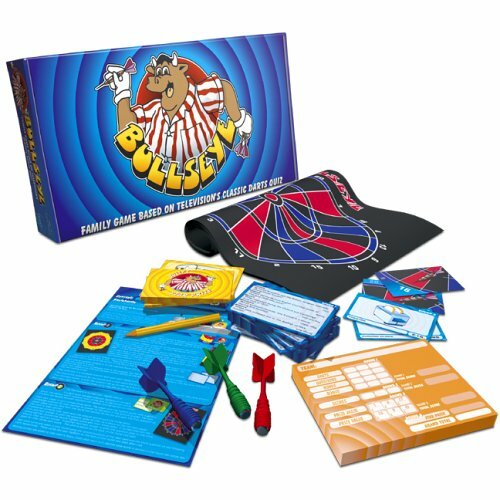 The video clip above features the moment when the Bullseye Prize Board reveals eight prizes, plus Bully's special prize! Relish the moment when Tony Green shouts out "iiiiiiiin one" etc.